The disappearing honeybee colonies have been blamed on cell towers, pesticides, GMO crops and more. Until we know for sure, we can’t rule any of these things out, but researchers are now looking at another possibility for colony collapse disorder. Parasitic flies. The parasitic flies in question turn honeybees into night-flying zombies. Since 2007, CCD has decimated thousands of hives in the US as bees go missing overnight. Professor John Hafernik of San Francisco State University in California has discovered that hosting Apocephalus borealis, a parasitic fly found throughout North America, makes the bees fly around in a disoriented way and congregate near lights until they die and the fly larvae emerge from their bodies. It makes sense that this is at least partially responsible for CCD, since the bees seem to leave their hives and don’t return. 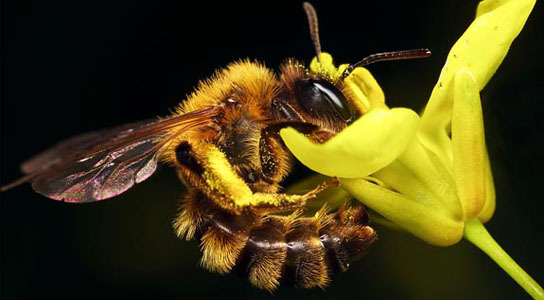 Now the team will investigate whether the night flights occur because the parasites affect the bees’ “clock” genes, which dictate when they are active. It may also be that contaminated bees are ejected to save the hive. Either way, it sounds like Professor Hafernik and his colleagues are on their way to a better understanding of the situation. Be the first to comment on "Parasitic Fly Could Be Responsible For Disappearing Honeybees"